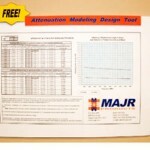 MAJR Products has a free aperture attenuation modeling tool to determine shielding effectiveness of printed circuit board shields and other enclosures. This Excel spreadsheet program is used as an internal design tool by engineers at MAJR Products Corporation as a service to our customers. This service provides an estimate of shielding effectiveness of a new or existing shield design(s) without costly pre-testing. The program is intended to present a spreadsheet-modeling program (Microsoft Excel format) for the calculation of shielding effectiveness resulting from apertures (holes and/or slots) in printed circuit board shields or enclosures. The program provides an estimate of the resultant shielding effectiveness due to ventilation holes needed for heat management or folded metal that form slots on the sides of a board level shield.